By default Cursor Hider hides mouse pointer by changing current cursor to transparent cursor (do it invisible). Some applications (MS Excel, Windows Media Player, games, etc) prevents changes cursor to other. 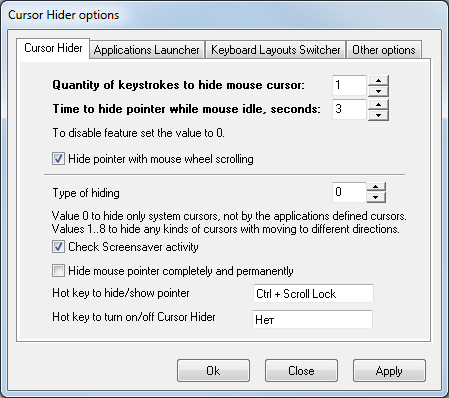 For these cases Cursor Hider has the setting "Type of hiding" to additional moving mouse pointer out of working window or even out of screen for full screen applications where cursor's image may be changed to transparent image. With any mouse action (moving or clicks) mouse pointer is returned to stored position and reverted application custom cursor. Screenshot Options window. "Type of hiding" set to 0. "Type of hiding" values define direction where pointer will moved. 0 - no moving, hide only. 1 - move out of left-upper corner of screen. Sometimes cursor moving is conflicted with other applications such as windows task bar is in auto hide mode, toolbars or hidden application activated by mouse moving over some screen area, usually near by screen sides. To exclude conflicts with other applications change "Type of hiding" (read as "Direction") to other non conflicted value.